Only about one American private-sector employee in 10 works for an organization that provides paid leave for new parents. But a growing number of major employers in Minnesota are offering the benefit, figuring it's not just a nice thing to do but also a smart business move. 3M recently announced that it would give virtually all moms and dads in its U.S. operations 10 weeks of paid leave for the birth or adoption of a child. 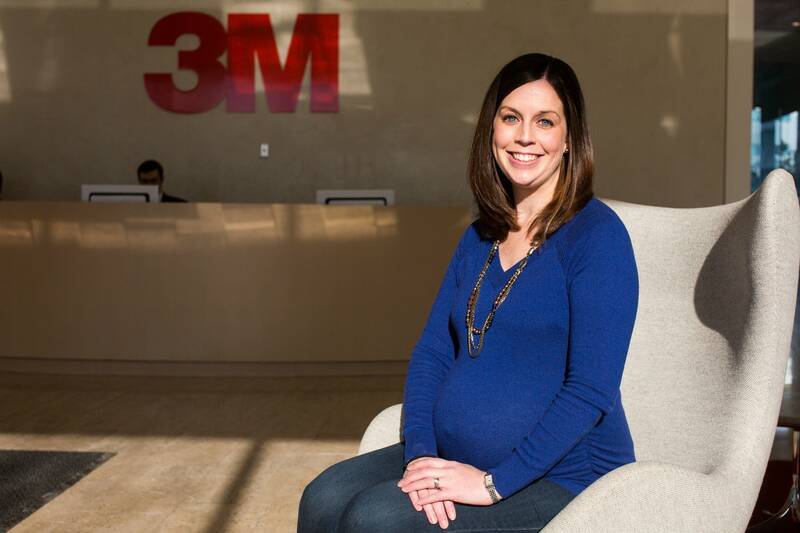 That was well timed for Meghan Keating, a 3M supervisor who will soon give birth to her second child. "A program like this one truly empowers employees to have the first question they ask be, 'What is the right amount of time for me to spend away from work during this special and important time as a new family?'" she said. "As opposed to simply, 'How much time can I afford to be away from work?'" • Share your story: What is the parental leave policy at your workplace? With disability pay to recover from the birth, Keating will be off as much as 18 weeks with pay. If she desired, 3M would let her take up to 10 more weeks of leave without pay. Federal law only requires up to 12 weeks of unpaid leave for most government and private-sector workers for the birth or adoption of a child, or to care for seriously ill family members. Most people can't afford to take much time off without pay. But U.S. employers are facing growing social, political and competitive pressures to provide paid parental leave. Unemployment is low and baby boomers are steadily leaving the workforce. That's helping to create an increasingly tight job market for talented professionals. "For us, it's not really a cost issue," said Mike Anderson, a 3M human resources executive. "It's about investments we're making for the long term for our employees. We're looking at attracting and retaining talent, creating a more engaged workforce." 3M is not the only area company to make such moves. Last June, Wells Fargo started to offer 16 weeks of paid leave for mothers and four weeks for dads. Janelle Debus, a recruiting manager for Wells Fargo, and her husband — also a Wells Fargo employee — will both take paid leave after the birth of their third child. And when they return, they will not have burned up other paid time off they've earned. "It doesn't take any time out of your vacation or sick time and it's all part of this new leave, which is awesome," Debus said. Next week, Cargill will begin granting employees between two and four weeks of paid leave to care for newborns, adopted and foster children and seriously ill family members. Target, General Mills, Thomson Reuters, the Star Tribune, the University of Minnesota and the cities of St. Paul and Minneapolis are among other local employers that offer paid parental leave. Some companies readily share their parental leave policies. Others don't like to disclose or talk about them, if they exist. When asked about its parental leave policy, a Medica spokesperson wrote in an email that the company was evaluating and possibly changing its policies and did not feel it "appropriate to respond with information about our current policies." Cam Winton, director of labor policy at the Minnesota Chamber of Commerce, suggested that it's best to avoid government edicts and let employers figure things out. "More and more businesses are offering paid family leave, paid parental leave to compete to attract and retain workers," he said. "It's not good policy to try to mandate some one-size-fits-all-solution from the State Capitol in St. Paul." But many proponents of paid parental leaves argue that most parents won't get them without government intervention. "There are great disparities in terms of who has access to this kind of leave and who doesn't," said Debra Fitzpatrick, director of the Center on Women, Gender and Public Policy at the Humphrey School of Public Affairs. "We know that a quarter of women are returning to their jobs within two weeks of giving birth." Fitzpatrick helped lead a University of Minnesota study of how a paid parental and family leave program funded by a payroll tax could be implemented in Minnesota. Three states — California, New Jersey and Rhode Island — have such programs, and New York will enact one in 2018. So far, the idea hasn't won the legislative support needed to advance in Minnesota. But Fitzpatrick expects that paid leaves to care for children and other family members will spread. "There's growing energy to do something about it," she said. "I'm optimistic that we'll continue the conversation about what the best way to do it is." Even Republican President-elect Donald Trump has joined that conversation, saying he wants six weeks' paid leave for new moms. How that would work is unclear. Romy Newman said policies across the nation vary greatly. She's a co-founder of Fairygodboss, which has compiled the maternity leave polices of roughly 1,500 companies. They include UnitedHealth Group, U.S. Bank, Medtronic, Boston Scientific and Land O' Lakes. "The number of weeks, the percentage of pay, even within a company can vary," she said. Newman said Trump's idea could be a baby step toward bringing the United States in line with the policies of developed nations that mandate up to a year off with pay for new mothers. "If we were to be like any other country, we would have a federal law that required paid maternity leave or parental leave," she said. "We'll see what happens with the new administration." With Republicans controlling the state Legislature, it's a good bet there won't be any mandated paid-leave program in Minnesota anytime soon. But there could be support for measures such as tax credits for employers choosing to grant paid leaves. "Giving a carrot versus carrying a heavy stick is probably the better route," said Rep. Sarah Anderson, R-Plymouth, who chairs the state government finance committee. "Businesses themselves are trying to keep and retain their employees and are looking at different ways to do that." Anderson also said Gov. Mark Dayton's plan to offer six weeks' paid parental leave for state employees is not going to fly. Last month, the Dayton administration proclaimed that such leave is available to 32,000 state employees. But Anderson said the governor does not have the authority to grant the leave himself. "If that's what the state employee unions want to negotiate for, they will have to go through the collective bargaining agreement just like they do for any other benefit they receive," she said.